The MENCS will have a normal schedule this week. There will be one practice Friday (1pm ET on NBCSN) and two practices Saturday (11:30pm on NBCSN and 2pm ET on NBCSN). Qualifying will be Friday evening at 6pm ET on NBCSN. Our Driver Group Game picks need to be submitted before 8am ET Friday. Kevin Harvick will show up with the fastest car at Homestead, but can the No. 4 team avoid mistakes? Kyle Busch only led one lap at Las Vegas, Kansas and Texas. The No. 18 team has seven days to find some speed. Martin Truex Jr. is the wild card. He has been inconsistent in the playoffs. The No. 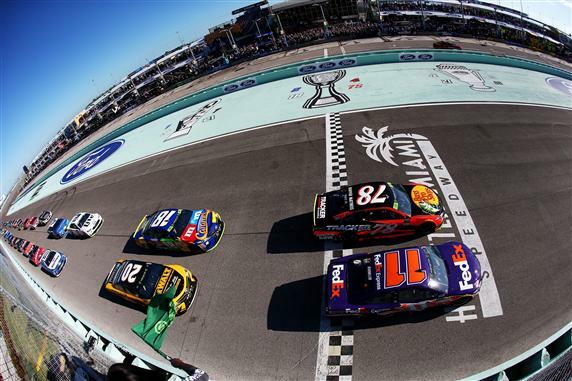 78 team needs to be at the top of their game in order to have a chance to win at Homestead. The No. 22 team had 3 weeks to focus on their Championship car and the numbers suggest Joey Logano should be your 2018 MENCS Champion. He has the best average finishing position in the playoffs, best finishing position at the three intermediate tracks in the playoffs (Las Vegas, Kansas and Texas) and he led the 2nd most laps behind Harvick. The No. 22 pit crew has been lightning fast and they should win Logano the Championship Sunday. If allocations were unlimited, I would use Kevin Harvick and Joey Logano. The Fords have had the most speed on the intermediate tracks and I doubt it will change Sunday. I am out of allocations with Kyle Busch and Harvick but there is still some good drivers to choose from. If you need o know which driver to select this week, simply look at my rankings under my selections for Group A.
Joey Logano (7): The No. 22 team had 3 weeks to prepare their car for the championship race. Team Penske choose the No. 22 car to represent the team at the tests at Richmond, Kansas and Texas. I heard that the team used part of the test session to practice for Homestead. The Fords have had a lot of speed and the No. 22 team has had more time to prepare their car than any other team in the race. That has to mean something. Logano won the pole at Kansas and finished 8th. He qualified 8th Texas and finished 3rd. His pit crew is an all-star team made of the best performers from the No. 2, No. 12 and No. 22 teams. They turned the fastest two pit stops of the season at Texas. They will be the edge Logano needs to win Sunday. Kyle Larson (5): I am out of allocations with Kyle Busch and Kevin Harvick so I needed another driver to pair with Joey Logano. I thought about using Martin Truex Jr., but the stats for Kyle Larson are too good to ignore. To say Homestead is his best track is an understatement. The No. 42 car has qualified 2nd and 3rd in the last two races in Miami, led 132 laps in 2016, 145 laps last year and has a 133.7 Driver Rating. No driver is even close in stats to Larson. I would not use Larson over Kevin Harvick or Joey Logano because the cream usually rises to the top in the championship race, but he is my 3rd pick in Group A.
I am out of allocations with Kurt Busch, Clint Bowyer and Ryan Blaney. I wish I had allocations with Busch and Blaney because these two drivers rank 2nd and 3rd in Group B at Homestead. I still have enough allocations with good drivers to get us through the final race. Chase Elliott (1): I was upset to see Elliott get eliminated from the playoffs at Phoenix, but he will have many chances in his career to race for the championship. The No. 9 car is the best choice in Group B this week. Elliott has a 6.2 average running position on the 1.5-mile tracks in the playoffs and he won the race at Kansas last month. Elliott finished 5th at Homestead last year and he should add another top-five finish to his resume Sunday. Eric Jones (1): Jones will likely be the driver I pair with Chase Elliott in Group B. He has been very good at the 1.5-mile tracks in the playoffs. Jones finished 4th at Kansas and 4th at Texas. He only has one race in the MENCS at Homestead. Last year he qualified 21st and finished 14th. His average finishing position in the Xfinity Series at Homestead is 6th. Jones should finish in the top 10 again this week. Aric Almirola (1): Almirola almost made it to the championship race. The No. 10 team has been the biggest surprise of the 2018 season. The difference between Almirola and Danica Patrick in the No. 10 car is night and day. This team may be disappointed at the results from Phoenix but they must be happy with their season. Almirola has finished in the top 10 in all three races on the 1.5-mile tracks in the playoffs. His Ford is fast and should finish in the top 10 in the Ford EcoBoost 400. Austin Dillon (6): I doubt I will use Dillon in the race Sunday but the rules state we must have four drivers in Group B. During the practice at Texas, Dillon said, “We are just working on setups for the intermediate tracks. We tried a lot of different things and we think we found some stuff that will help us at Homestead and we can bring into the 2019 season.” His results show that they did find something. Dillon finished 11th at Kansas, 10th at Texas and 8th at Phoenix. The No. 3 team is trending in the right direction. It is slim pickings in Group C this week. I am out of allocations with Alex Bowman and William Byron. These are my top two drivers from this group and I recommend using them if they are available to you. There are two others drivers who should score well. If you are out of allocations with the No. 88 and No. 24 cars, do not panic. We can still get through this final race. Chris Buescher (3): Buescher is the next best pick behind Alex Bowman and William Byron. He has actually performed a lot better than Byron in the playoffs. Buescher finished 15th at Las Vegas and 16th at Kansas. That is pretty good for a Group C driver. Buescher finished 20th in his first MENCS race at Homestead. His team is a lot better now than it was last season. Michael McDowell (7): McDowell is a good sleeper pick Sunday. He has been hit or miss on the 1.5-mile tracks this season but Homestead ranks as his 5th best track. McDowell only has one finish in the top 10 at a 1.5-mile track and it happened at Homestead in 2016. McDowell qualified 26th and finished 10th. Unless we get a “ringer” entered into the race this week, McDowell is the 4th-best choice in Group C.
Group C Driver Rankings: 1) Alex Bowman) William Byron 3) Chris Buescher 4) Michael McDowell 5) Bubba Wallace Jr. I will post my final picks for Driver Group Game Saturday evening.